Did our two Viking landers find life on Mars in 1976? Astonishingly, thirty seven years later, we still haven't sent anything to Mars able to answer this question for sure. None of our spacecraft since Viking would be able to spot life which we now know exists in the driest deserts on Earth, and only one of the experiments on Viking had this capability. There are hypotheses about what they found, but no definite proof. A few years back, to everyone's complete surprise, Joseph Miller, specialist in rhythms of life, spotted smooth daily cycles in the data from 1976, strongly suggesting life processes. So did Viking spot life or are these smooth cycles signs of something else, perhaps some complex chemistry? Nowadays most researchers think that there is some liquid water on present day Mars. Even so, our best analogs on Earth are the driest areas of the Atacama desert, or the McMurdo dry valleys in Antarctica. These are places with patches of hard to detect microbes. They are so hard to detect, that in some of the habitats, life was discovered for the first time in the last decade. Many of the microbes live beneath surfaces of rocks or below the surface soil, slowly growing; sometimes with individual microbe lifetimes of thousands of years. If there is life on Mars it's likely to be like this. Hard to spot visually and difficult to detect with our instruments also. Curiosity, for instance, wouldn't have much chance of finding it. 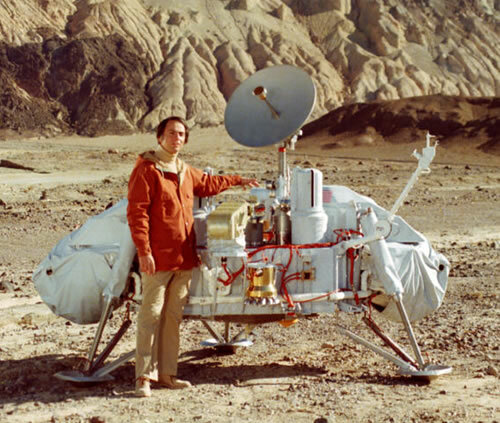 Carl Sagan standing next to a model of the Viking Lander - so far the two Vikings are the only spacecraft ever sent to another planet to search for life. Curiosity's main focus is on habitability of ancient Mars, and can search for organics, but it is not equipped to detect present day or past life itself, at least, not in the low concentrations you'd expect. Two of the three Viking experiments drew a blank, but we now know that they were probably not sensitive enough to detect in these ultra low concentrations. (see also original paper- though, note that some scientists think that the other experiments were able to detect ultra low concentrations of life. - this whole field is controversial). Our later rovers such as Spirit, Opportunity and Curiosity would have no chance at all of spotting the life that exists in the most inhospitable ares of the Atacama desert or McMurdo dry valleys. Then, another twist in the story, a recent re-analysis of the Viking data suggests that these two experiments might have detected organics after all. They detected chlorohydrocarbons which were dismissed as contaminants at the time, but might well be the result of reactions of perchlorates with the organics (Phoenix discovered perchlorates in the Martian soil in 2008). The upshot is, we've only sent a single experiment to Mars with a decent chance of finding life there - and it came up with results that are strongly suggestive of life, though most would say, not conclusive. NASA, perhaps understandably, discounted its results at the time. But now that we know that the other instruments had almost no chance of spotting life there, their reasons don't seem as convincing as they did to many back in the 1970s. Close up of the Labeled release experiment on its testing rig in the laboratory. Photograph from the original paper published before Viking landed on Mars. According to modern understanding of conditions of Mars, this is arguably the only instrument humans have sent to Mars which had any chance of spotting present day life there in the sparse populations we'd expect in such dry desert like conditions. I'd like to look a bit closer at the Viking results here, and also look at the possibilities of life able to survive in the equatorial regions of Mars. Then, let's look forward at experiments we could send to Mars to settle this question about the Viking results, and look at how the labeled release and other experiments could help with the search for life in other places on Mars if it turns out that Viking has another explanation, or to help find life in other habitats. It's a simple idea. You prepare food for micro-organisms with the ordinary carbon 12 replaced with radioactive carbon 14. They will normally give off some gases including carbon, such as carbon dioxide, and methane, when they digest the food (they may also produce some hydrogen and hydrogen sulfide). You then detect the radioactivity in the air. The great thing about this experiment is that it is very sensitive - and doesn't require the organisms to reproduce. Microbes from cold dry places such as Antarctic dry valleys will often have long lifetimes and reproduce only every few months, or may go for a thousand years in a slowly metabolizing almost dormant state before they reproduce. When you bring them into the laboratory then they are often reluctant to reproduce and keep this slow pace of life. You might need to wait several months, even years, to see a change. But if you test for evolved radioactive carbon, it doesn't need to reproduce, just metabolize. This makes it exquisitely sensitive, and the team were able to show that it could detect life even in places such as the dry Atacama deserts, and the McMurdo dry valleys. Yet at the same time it was not confused by the signals e.g. of organics in lunar soil. (Lunar soil does have some organics in it from the solar wind and from meteorites, in parts per billion). If we find organics on Mars, that doesn't need to mean life. Even if we find chirality signatures, then again that's not a definitive proof of life as there is a chiral signature in meteorites, with some having a surprising excess, and both radiation and warmth can degrade the signal. In this 2006 analysis the EET92042 and GRA95229 meteorites had chiral excesses ranging from 31.6 to 50.5%. GRA95229 - another chondrite, collected in Antarctica, had chiral excesses of +31.6‰ for a-AIB to +50.5‰ for isovaline, while the EET92042 meteorite ranged from +31.8‰ for glycine to +49.9‰ for L-alanine. It's thought that these excesses are extraterrestrial and not due to contamination by Earth life. You'd notice if it had 100% of one of the amino acids. But then amino acids can swap handedness in warm conditions (racemization) and any ancient organics may be thoroughly racemized if they have been warm for some period of time (you can work back if it's been kept at reasonably cool conditions by looking at the different rates different amino acids transform). The situation would get especially complex if you still had some of the original amino acids with, say, a meteorite chirality excess and some converted into life, or a mixture of ancient and present day organics. So the chirality signal may be clear, but it might be confused and need detective work to find out what is there. If we find RNA or some complex molecule not found in meteorites, would be a reasonably good evidence of life. But still, strictly speaking, it's not proof, you'd still ask if there is any inorganic way of making it. One recent paper found that RNA strands of up to 400 bases can be made by freezing processes in sea ice - without any intervention of life. See Did Life Evolve in Ice? (Discovery Magazine) and for the original paper, Ice and the Origin of Life. Hauka Trinka who studied sea ice in the Arctic regions, and came to the conclusion that RNA gets formed in the ice through inorganic processes, producing RNA chains of up to 400 bases. He thinks this may be a possible mechanism for origin of life. Whether this is how life began or not, his experiment also shows that detection of RNA does not by itself prove that you have life. You might need other evidence even in such an apparently clear case as this, after all if you relied on RNA detection you'd conclude that his artificial sea ice experiment created life from amino acids, when all it created was RNA, a biosignature, but no life. But if we find evidence of active metabolism, and transformatio0n of organics into gases, that's a good sign of life, and if we can find evidence of circadian rhythms, and the rhythms go out of sync. with the Martian sol under constant conditions - that would be hard to explain as anything except life - or at least, some really really complex chemistry getting on for the complexity of life itself. If we could find all that - and at the same time, evidence of complex chemicals with chirality - then the two observations would complement each other. Labeled release type experiments might help find forms of life that are novel, extremely different from Earth life (e.g. not based on DNA). It would also tell you something about its metabolism and capabilities, e.g., you might learn whether it can photosynthesize and what are its preferred temperatures, and in more refined versions of the experiment, you could learn what gases it produces during metabolism, what amino acids it uses, and so forth. Circadian rhythms are the rhythms of life. We get hungry in the daytime and sleep at night, and suffer from jet lag, all because of these rhythms. Micro-organisms have them too. They follow day and night cycles - but not exactly. Rather the rhythms run on their own but use heat, or sunlight or both as a reset, to keep them in sync with the days and nights. That's why you get jet lag as your body gets back in phase with the shifted rhythms. Microbes are the same; they also have a form of "jet lag", a delayed response to changing external cycles. Joseph Miller is a specialist in circadian rhythms who spotted something unusual in the Viking data which nobody else had noticed, It seemed, to his expert eye, to strongly resemble terrestrial circadian rhythms, and with a period of a Martian sol. He was able to get hold of the original raw data. This was not easy because it had been stored in microfiche format but mixed up with data from the other experiments as well as engineering data - and some of the images not so easy to read, making it a long project to extract it. It was also stored on CD - but mixed up with huge amounts of engineering data - and the documentation of the CD didn't give enough information to restore it. Luckily Gilbert Levin's co-researcher Pat Straat had kept extensive printouts of most of the LR data, and so finally the team were able to use these to get most of the data. They then used the microfiche data to fill in gaps. For the details of what he found, see his paper Periodic Analysis of the Viking Lander Labeled Release Experiment. Let's look at some of his main results. He then analysed the data using all the tools you use to detect Terrestrial circadian rhythms, and the results all came up positive. The experiment was isolated from the fluctuation of day night temperatures on the Mars surface, but imperfectly, so still had temperature fluctuations. His main alternative hypothesis was temperature dependent solubility of the CO2 in the soil. However this didn't seem to be able to explain all the effects seen. First, it was not quite enough of an effect to explain the data. Then, the LR data follows these fluctuations, but doesn't follow every fluctuation exactly as you'd expect from a purely chemical reaction to the temperature change. You get changes in temperature with no changes in the CO2, and the curve is smoother than you'd expect from the noisy temperature data, which also has other regularities which the LR data doesn't respond to. The LR response is also delayed by 2 hours after the temperature fluctuations. From the design of the experiment he concluded that though a 20 minute delay was possible, with variation in CO2 solubility, 2 hours seemed too much of a delay to explain by chemical reactions. Then another thing which is suggestive, but unfortunately not conclusive, there seems to be a sign of a change of rhythm after the second nutrient injection. This is something that often happens with circadian rhythms. Shows temperature fluctuations in red, and the radioactivity measurements in black. The black lines are almost synchronized with the temperature fluctuations, but delayed by two hours, and don't follow every variation exactly. This is an actogram. Looks complicated perhaps but idea is simple. It's just a long timeline broken up into pieces stacked on top of each other. It's double plotted so the second half of each line overlaps the first half of the next line, and each line is two Martian sols long. You read it from left to right and top to bottom. Each row starts one sol later, and is two sols long so the right half of each line is the same sol as the left half of the next line, and the black lines show times when the labeled release values are above the two sol average. The white circles show the moments of maximum LR for each sol. The white diamond at day 7 show the moment of the second nutrient injection. If you draw a line between the white dots, it slants down towards the right to start with, delaying each day, with a period of 25.46 hours, but then at the second nutrient injection starts sloping to the left with a period a few minutes short of the Martian sol of 24.66 days. The new pattern is interpreted as due to the advancing sunset times on Mars, as he found that it follows them almost exactly. This change of slope is a common feature of circadian rhythms after nutrient injection - though with only six days, there is not enough data to be certain that the slope did change; it could just be a statistical anomaly. If it did, then apparently it's hard to think of a good explanation not involving biology. They plan to do more analysis of the data. To a trained eye, apparently this is all suggestive of a circadian rhythm, though not conclusive. Another thing strongly suggests biology rather than chemistry as an explanation. The "active ingredient" whatever it is is deactivated, not only by high temperatures, but also by keeping the soil in darkness, at a temperature of 10°C for two months before it is used in the experiment. This was an accidental experiment, they used samples collected at the beginning of the experiment and stored, out of concerns about whether the scoops could stand up to repeated scooping. It turned out that after this period of two months, in cold and darkness, it lost whatever it was that gave LR activity. It's hard to think of some chemical explanation, why two months of storage would inactivate an active chemical ingredient of the soil - with the only difference from its original condition on the Mars surface, that the temperature was kept constant and that it's excluded from light. Whatever is going on here, it's either something biological, or some complex chemistry. Either way, it's a highly unsatisfactory situation that nearly forty years on, we have no idea at all about what it is that Viking found. WHAT ARE THE OPTIONS FOR LIFE AT THE VIKING LOCATIONS? First of all, it's exceedingly dry there. You may know that mountaineers who climb Mount Everest can't make a very hot cup of tea. The boiling point of water decreases with altitude. Everest base camp - water here boils at about 82°C because of the reduced atmospheric pressure. On Mars, at the Viking sites, the boiling point of water is about 5°C. This means that as soon as the water melts, it's close to its boiling point. When you put out your washing on a warm day, you know that the clothes don't need to reach boiling point to dry out. Any dampness on Mars is within a few degrees of its boiling point, and will dry out very rapidly indeed. It's so dry there that even ice will evaporate, by a similar process. It's slower, but over geological time then the ice in the equatorial region should dry out completely to great depth. One thing that saves the situation a bit is that Mars' axial tilt varies far more than Earth. At present it is more or less same as Earth. But sometimes it tilts so far that it's poles are warmer than its equator and it gets snowfall at the equator and equatorial ice sheets. Those ice sheets don't hang around for long though as it tilts back up to its more usual angle. After a few hundred thousand or million years then there should be nothing left, not just at the surface but for tens or hundreds of meters below the surface. Even at ultra low temperatures below the surface, in the near vacuum of the Mars atmosphere, ice slowly evaporates, then recondenses closer to the surface, then evaporates again, recondenses and so on until eventually it reaches the surface and disappears into the atmosphere. Deep down you do find ice. This is Mars' cryosphere. It extends for kilometers, and then finally we think that at great depth it probably has a hydrosphere as well - as the temperature of the rock increases. This is a layer of water kept warm by geothermal heat. It might be the most habitable part of Mars for microscopic life and indeed might have lots of life, as similar places on Earth have abundant life. But it's not easy to see how it could get to the surface in normal circumstances. Pole to pole cross section of Mars showing the cryosphere - permanently cold enough for ice - and below it, the saline groundwater. This may well be the most habitable region of Mars - on Earth similar habitats deep below the surface have abundant life - but may not be much exchange with the surface. Liquid water could approach the surface however around geothermal hot spots - and perhaps that could give a conduit by which the water deep down indirectly feeds features on the surface through the cryosphere. It's a possible indirect source of water in equatorial regions of Mars, but if so, likely to be localised to geothermal hot spots. We know now (though it wasn't known at the time of Viking) that the surface equatorial regions are not completely devoid of water, so there must be something else going on. First, ground penetrating radar showed possibilities of ice below the surface, in the Medusae Fossae Formation - it's either miles deep layers of either equatorial dirty ice or very porous regolith all the way down. Do you see how there is a faint double line of white in the middle of the picture showing a secondary reflection layer in the radar image? That's the region with probable ice deposits in equatorial Mars. See also Water on Mars May Have Piled Up as Ice Near Equator and for the technical paper Radar Sounding of the Medusae Fossae Formation Mars: Equatorial Ice or Dry, Low-Density Deposits? (abstract) - and powerpoint style slides. Then more recently, we spotted what are believed to be actual damp streaks on the surface, or at least streaks in some way caused by water. Just a few places here and there, with other identical places that don't have them. Warm seasonal flows on Mars. This is in Palikir crater, which is 41 degrees North. They have also been spotted in regions close to the equator. There is some chemical process going on here as the streaks show traces of ferric and ferrous iron. So far nobody has detected water in them, but that might be because they are so thin, well beyond the resolution of their spectroscopic observations, and any water may be in small quantities. The reason for thinking these are water are - that they only form on sun facing slopes, only form when the local temperatures get above 0°C, and they lengthen in the spring, and gradually vanish away in the autumn as winter progresses. This doesn't match what you'd expect from dry ice (which also would be a surprising thing to find in equatorial regions) and it also doesn't fit wind formed features either. 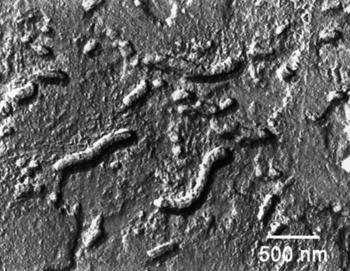 There are many temporary wind formed changes on Mars, but these, it seems, aren't one of them. Sadly the streaks are too narrow, and too thin to get a spectroscopic analysis of them from orbit. So it's not yet possible to confirm absolutely that they are water. But nobody has any other suggestions, and all the modeling is focused on different ideas for getting them to work with water, probably salty water (so it is liquid at somewhat lower temperatures, easier to stay liquid in Mars conditions). The first two seem unlikely explanations for water at the Viking site, not likely both sites were above a geothermal hotspot (must be very rare on Mars with no hot spots yet detected from orbit, and no active volcanoes though clear signs of geologically recent activity). It's also unlikely that both sites happened to be above deposits of ancient ice (as far as we know or expect, rare in equatorial regions). The last one, the deliquescing salts idea, though, might be quite promising. Then there's another idea that could support life almost anywhere on Mars, without deliquescing salts, just using night time humidity of the air. This is an observation that goes back to Viking. You get frosts even in equatorial latitudes. This shows that though there is hardly any water vapour in the Mars atmosphere (absolute humidity is low), yet at night it gets cold enough for 100% relative humidity. Here relative humidity is what makes cumulus clouds form, for instance. As the warm air rises, it cools down. There is no more water vapour in the air than before, but the colder air can't carry so much water so it condenses out as the droplets of water of a cloud. It's also the reason you get morning dew, ground fog, and frosts. As the temperature falls, absolute humidity doesn't change, there is no more water vapour than before, but because of the reduced capacity to carry water vapour, the relative humidity rises until, when it reaches 100%, it has to come out of the air as a cloud, dew, fog, or frost. On Mars then the water vapour forms frost, or ice crystal fogs or clouds (on Earth, cirrus clouds are similarly made of ice). Conditions are too cold and the air too thin for water vapour clouds (except just possibly at deep locations like Hellas basin). Frosts on Mars - this photograph from Viking 2. Mildly enhanced to bring out the colour of the frost. This shows that there is a hundred percent relative humidity of the air on the surface at night. In the day time, when it melts it probably evaporates instantly into the air. But deliquescing salts could trap this evaporating moisture, and retain it long enough to be useful. When the frosts melt, then though they evaporate too quickly to be of use for life, this creates a temporary source of high humidity at soil level, which could be exploited by life. First, you get communities of micro-organisms in coastal areas beneath quartz inclusions in the rocks. In coastal areas, 80% of the quartz inclusions can have life, which get their water from the fog, and all quartz inclusions over 20 grams were colonised. Fog is a source of water for life in coastal regions of the atacama desert. Fogs on Mars (digitally enhanced) in the Valles Marineres - however these are fogs of ice rather than water. See Fog phenomena on Mars. (first page and five minute free preview available at DeepDyve). 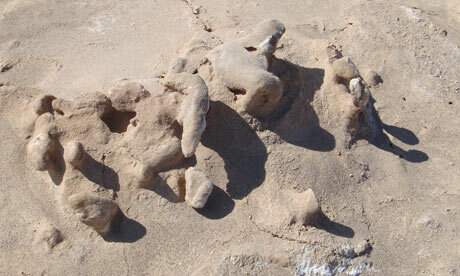 This shows quartz inclusions in the coastal regions of the Atacama desert. The green in the photograph at bottom left shows algae underneath a rock, probably Chroococcidiopsis. Quartz inclusions on Mars could be a promising habitat for similar species. Chroococcidiopsis particularly is a prime candidate for a life form on Earth that could survive on Mars because of its multiple extremophile adaptations, and its ability to survive as primary producer in a single species ecosystem, and tolerance of ionizing radiation in quantities that would kill most microbes. Though Mars has fogs of ice rather than water droplets, that's just because the air is so thin. It does have high humidity at night. In the driest part of the desert, there's no fog and no rainfall for years on end. Yet you still get life. It can get this through salt deposits which take in water from the atmosphere, a process known as deliquescence. This makes the salt slightly damp, and microbes can make use of this. This shows images of salt crystals from the hyper-arid core of the Atacama desert. The dots show regions that were analysed with Raman spectroscopy and found to contain life. Hyper-arid core of the Atacama desert. Originally it was thought, conditions here are so inhospitable that it would be the "dry limit" of life. But in 2002 researchers found life here by DNA sequencing. Originally it was thought, you could only have dormant life that relied on the very rare rains here. But now it's known that life there can survive without any rain at all. 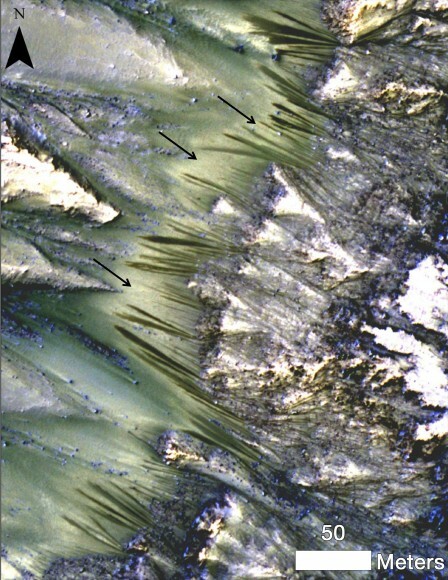 Similar habitats such as colonies inside halite crystals, or beneath quartz inclusions, could occur in equatorial regions of Mars. For the original paper here, see Habitability of transgressing Mars dunes. This is a paper written in 2013 just after the Curiosity landing, and looks at conditions in Gale Crater, and found that there's a possibility of present day life there. This is an idea that we've had since Phoenix and its discovery of salts which we know can deliquesce, and discovery of the drops of what looks like water deliquescing on its legs. Unfortunately we didn't have the capability to analyse them, just visual evidence, but is hard to see what else they could be, dark drops that grew gradually, occasionally merged, and eventually drop off. When they dropped off they never formed again at the same spot. Most likely, this shows a process of deliquescence on salt thrown onto its legs during the landing. Certainly it's a theoretical possibility. Also the Phoenix observation of isotope ratios in the atmosphere show that the CO2 in the atmosphere must have come from recent volcanic eruptions, and that the oxygen has subsequently changed atoms with some material on the surface, which almost certainly means, dissolved in water. That's good indirect evidence for reasonably abundant water, either thin layers over much of Mars or occasional meltings (e.g. meteorite impacts on the polar regions and high latitudes) or both. Of course both possibilities are of interest for present day life on Mars, but the idea of a permanent layer of liquid water is the one of most promise for the Viking results. The paper suggests that the melting salts would create humidity which would be captured by salts in Gale Crater (similar processes elsewhere of course but the paper focuses on possibilities for Curiosity). They suggest magnesium perchlorate and calcium perchlorate as possibilities for capturing the water. They suggest ferrous and ferric iron, or ferrous iron and perchlorates as the energy source. The moving sand dunes would churn up the soil and mix the reducing lower parts of the soil with the oxidizing surface layers and bring up nutrients from below the surface. This striking image from Mars Reconnaissance Orbiter shows quite how much sand movement you can get on Mars. In places, sand dunes as high as 200 feet (61 meters) are moving over the surface of Mars - a surprising result with its thin atmosphere (but strong winds and months long dust storms sometimes). Sand dune movement could churn up the soil and bring deliquescing salts to the surface, and also mix up reduced and oxidised chemicals, making conditions easier for life. Just mentioning this, as it could just possibly be evidence of life in equatorial regions of Mars - but won't spend much time on the topic here, as it is controversial, whether this is evidence of life on Mars or not. It's a shiny coating that forms on rocks in desert landscapes. Nobody is quite sure what causes desert varnish on the Earth. The curious thing is, it doesn't seem to be a weathering effect as the composition of the varnish is independent of the rock it forms on. It might be life, but might also be non life processes. The problem is that it's easy to find life in the varnish on Earth - but it might just be coexisting with it. Since the varnish forms slowly over thousands of years, you can't run experiments for long enough to duplicate the exact conditions that lead to its formation. Mars also has desert varnish. Curiosity made some accidental measurements which might possibly give information about its properties. But generally it's not well understood either on Mars or on Earth. Of course any dedicated life mission to Mars should examine the desert varnish and see if there are any organics there, or any signs of life. This is research originally sponsored by the German aerospace company DLR. Lichens in tundra and cold high dry mountain conditions can often survive and grow without any source of water at all. Instead they take in water from the atmosphere, which has high relative humidity when its at its coldest. They are also protected from UV and drought, in conditions with higher than normal UV influx. Lichen P. chlorophanum on a Mars analog substrate for the DLR Mars simulation experiments. Though not adapted to live on Mars particularly, of course, these adaptations turn out to make them astonishingly resistant to Mars conditions. In Mars simulation chambers, which reproduce the thin atmosphere, the UV radiation, and the day to night variations in humidity, they are able to grow apparently completely normally even metabolizing and photosynthesizing, for weeks on end. High CO2 concentrations at normal Earth atmospheric pressures reduce photosynthetic activity, but if you reduce the atmospheric pressure to Mars levels, then this has a compensatory effect, and the levels of photosynthesis return to the same levels they have at normal Earth atmospheric pressures and CO2 concentrations. Five of the species of the lichen used in recent astrobiological studies - these are able to metabolize and photosynthesize in simulated Martian environments, and can withstand the UV light through protective chemicals such as parietin. They can take up the moisture directly from the atmosphere at times of high relative humidity, so have no need for deliquescing salts. 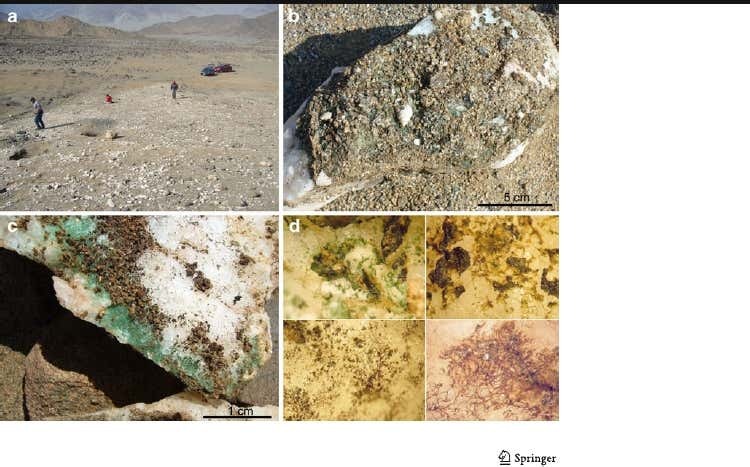 The lichens studied not only survive, metabolize and synthesize in Martian conditions - but in protected conditions (such as partially shaded or protected by a thin layer of dust) both algal and fungal components not only continued to metabolize, but quickly adapt to their new conditions. Within 34 days, the algal component of the lichen increased its photosynthetic activity to compensate for the harsher conditions. These lichens could survive almost anywhere on the surface of Mars provided you have sources of light, the CO2 from the atmosphere, trace elements from rocks, moisture from the air - and some source of nitrogen would also be needed, maybe from nitrates which we now know occur on Mars. These extremophile lichens can also survive cosmic radiation, UV, and the vacuum of space. Perhaps some lichens might even be able to survive the journey from Earth to Mars or vice versa, if so might be a shared species between the two planets. Gilbert Levin has been saying for years that he thinks green patches on Mars might be lichens. Whether that's right or not, these results certainly vindicate the idea that lichens on Mars are a distinct possibility, and it does make sense to search to see if we find any. There have been many researches of Chrooccocidiopsis which is a cyanobacteria with amazing resistance to space and martian conditions. These are ongoing experiments. A new one year mission called BIOMEX, part of EXPOSE-R2 is due to start on the ISS in April 2014 to explore their tolerance of Mars conditions further. This will fly a wide variety of organisms, including lichens, for 12 to 18 months. They will be exposed to a simulated Mars environment on the outside of the Russian module of the ISS. One possibility is that Mars life is nanobe scale. This is especially likely if it is an earlier stage of life not yet evolved to the size and complexity of Earth DNA based life. If so it might be hard to study - rather like the controversial nanobes on Earth which might or might not be some form of life. The jury is still out. 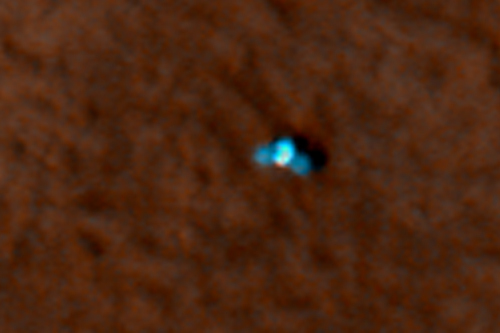 Nanobes in the Mars meteorite ALH84001. 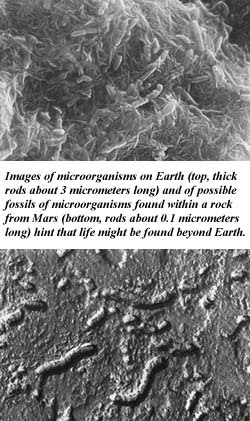 They resemble microbes but are far smaller, and nobody knows if this is a fossil of billions of years old Mars life or something inorganic. You can't fit all the machinery of a modern cell into something so small. However, early life on both Earth and Mars, before evolution of the modern cell, is likely to be smaller than present day cells and based on simpler chemistry, because there must have been many intermediate steps of evolution between amino acids and the most primitive cells we know (probably as many as there are between the most primitive cells and ourselves). Top image shows nanobes in Earth rocks. Bottom image shows the Mars nanobes to same scale. See Nanobacteria and Nanobes- Are They Alive? Nanobes are too small to see in optical microscopes. Instead you have to use tools such as electron microscopes. Most electron microscopes require you to prepare the specimen in a way that will kill life. The environment scanning electron microscope can look at life at normal atmospheric pressure and in wet conditions but you need to place it a fraction of a millimeter from the specimen. . It's no wonder that nanobes are so hard to study. If Mars life is nanobe scale, they'd be hard to study, but we might have the advantage over Earth of no large scale life to confuse the picture. Or if it has a mixture of both, then we have the advantage of a limited number of species of non nanobe scale life compared to Earth. All this of course also highlights the extreme care we need to take not to introduce extremophiles able to survive on Mars in our spaceships. Extremophiles can occur in all habitats, not just extreme habitats, as they tend to retain capabilities long term, in situations where they are no longer needed. If some organism could survive almost anywhere on Mars, like these lichens might do, and spread easily to new habitats, you'd expect exponential growth to start with. A doubling of population every month or two (slow for microbial life) could easily cover the entire planet within a decade. Nitrogen is important because nitrogen mediated hydrogen bonds are easily broken and are central to biology as we know it. So even if life on Mars is very different from Earth life, perhaps using different amino acids for instance (see Alien life could use an endless array of building blocks) and perhaps use PNA or some other form of XNA (Xeno nucleic acid) with a different backbone from DNA, still it is likely to use nitrogen if it resembles Earth life. For more, see Searching for Organics in a Nibble of Soil. Diagrams credit J. Bada. See also Seeking signs of life on mars: in situ investigations as prerequisites to sample return missions which goes into the importance of the search for nitrogen on Mars, as well as other considerations to guide our search there. Nitrogen is the one element necessary for life which seems to be in short supply on present day Mars . There is some in the atmosphere but only 0.2 mbar. This may be too little for nitrogen fixation by life processes. Nitrogen can be fixed by volcanic processes and lightning. It can also be delivered on meteorites, as some carbonaceous meteorites are rich in nitrogen. It can also be fixed by chemical reactions. A recent (2012) paper suggests fixation by reaction of FeS with NO might be a significant process in the primordial Martian atmosphere. It can also be fixed by meteorite impacts. 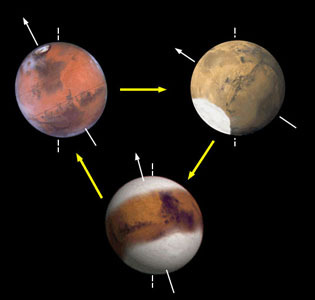 This may be the dominant process in early Mars. The very early Mars had far more nitrogen, between 200 and 600 mbar, so between 0.2 and 0.6 bars of nitrogen (present day Earth has 780 mbar). Another way it can get to surface layers is through nitrogen fixation in pure water metastable thin liquid films (different from the salty brines habitat) on Mars (cooled below the point where they would normally freeze). See An active nitrogen cycle on Mars sufficient to support a subsurface biosphere. There is at least some indigenous nitrogen on Mars, as Curiosity detected recently. But it's probably patchy and in short supply. However, we haven't looked deep below the surface. The situation could be the same as with the present day Atacama desert, the nitrogen might be present, but buried a few meters below the surface. Though normally well below permafrost layers, so unavailable to life, this could get churned up by the wind in moving dust dunes and so become useful to surface life. IS NITROGEN FIXATION POSSIBLE ON MARS RIGHT NOW? I can't find much about this for some reason, but found this 1989 paper, Biological nitrogen fixation under primordial Martian partial pressures of dinitrogen. The authors grew Azotobacter vinelandii and Azomonas agilis under conditions of low nitrogen levels, though at full atmospheric pressure and found that they could continue to fixate nitrogen down to 5 mbar. However they found no evidence of fixation below 1 mbar. The 5 mbar level there is far lower than the present levels of 781 mbar. Also they used normal non extremophile nitrogen fixators. An obvious follow up experiment would be to do the same tests, but with Antarctic nitrogen fixating extremophile micro-organisms and the extremophile lichens for the DLR studies. The authors of this paper propose the experiment to do that, but as far as I can see, haven't actually done it. If anyone here knows of research on the limits of low pressure nitrogen fixation for extremophiles, do say. If photosynthetic life could do nitrogen fixation in the Mars atmosphere, then combined with the ability to take up water, almost the entire surface of life would become available in partially shaded conditions for protection from UV. Just saying this because, though it's not mentioned in most papers, it's often raised as an issue by interested scientists not involved in this research. Six years ago, before Phoenix, and before the discoveries of the warm seasonal flows, most scientists would have said that ionizing radiation made life on Mars impossible. You can find plenty of news articles and papers up to 2008 saying this. However after phoenix, most recognize that it's not an issue after all. The problem was, that before they thought that life would have to survive for geological periods, between times of high axial tilt. Over hundreds of thousands of years, then all life in the surface or near the surface would get destroyed by cosmic radiation. Changes in Mars' axial tilt. Top right shows what it's like when it has equatorial ice sheets. However, over short time scales this is no problem at all. The life is now only required to survive for a few months in winter, and many microbes could do far better than that, could survive for centuries, even millennia exposed to the full force of the surface cosmic radiation. Even ordinary microbes can withstand cosmic radiation and repair their DNA in freezing conditions where it used to be thought that they were totally dormant. See Even Ordinary Microbes May Survive Radiation on Mars - the researchers looked at P. cryohalolentis because it didn't have any remarkable ability to shrug off the effects of ionizing radiation. The most radioresistant micro-organisms known might even be able to survive hundreds of thousands of years of surface radiation on the surface of Mars. Thermococcus gammatolerans - an obligate aerobe from hydrothermal vents, the most radioresistant organism known, able to withstand 30 kGy of gamma radiation, and still reproduce. That's about 400,000 years worth of surface radiation on Mars at the radiation levels detected by Curiosity during the current solar maximum of 0.073 Grays a year - possibly it could survive surface radiation for longer than that when you include periods of solar minimum. This micro-organism didn't evolve in an environment with high levels of radiation, but developed this resistance as a side effect of other effects that can damage DNA. Microbes on Mars would have evolved in an environment with high levels of radiation, and adapted specifically to that environment. They might be even more radioresistant than this. These are all ideas for present day life on Mars. But it's all speculation at present. We can't spot microscopic life that lives below the rocks or in the sand at Atacama desert or McMurdo valley like concentrations from orbit. They might well also have only negligible effects on the atmosphere of Mars. The only way to find out is to send life detection missions to Mars. If the Viking lander labeled release did find life, there may be life almost everywhere on the surface of Mars. This would be a major embarrassment for science, if we actually discovered Mars in 1976, but never followed up the experiment to check what we had found. But stranger things have happened, science often doesn't follow a straight line. It was understandable in some ways based on scientific understanding at the time, and the null result from the other instruments which was convincing at the time to most scientists. However it might be that Viking didn't detect life, and instead, some extremely complex chemistry, which we are not used to on Earth, since the soils on Mars are so different from Earth soil in many ways, with the oxidants and perchlorates. One way or another, it's unsatisfactory that nearly 40 years on we still don't know the answer. There was nothing wrong with the original experiment, as there was no way that any of the researchers at the time could know about the confusing chemistry of the Martian soil. What we need to do now, my own personal opinion, is to send the Labeled Release experiment back to Mars. Try to duplicate the original conditions and see if we can get the circadian rhythm. Then do a similar experiment with controlled conditions, with completely steady temperature - or can try light or temperature fluctuations out of phase with the Mars surface - and see what happens to the circadian rhythm. We can also test for chirality, see if the L or R amino acids are used preferentially. We could find out which amino acids the Martian active ingredient depends on first (by some binary search procedure feeding it with various subsets of the complete collection of amino acids, would narrow down quickly) - and then once we've done that, try feeding it only L or only R versions of one or more of those amino acids and see what happens. As they intended with Viking, we should have a whole suit of instruments, to complement the labeled release. With modern instruments, we could detect tiny traces of organics easily. For instance, the Astrobionibbler is able to detect a single amino acid molecule in a gram of sand. If Mars is as hospitable as the Viking LR experiment suggests, this has major planetary protection implications, of course, and would suggest we might well have contaminated it already. But it would also depend on what extremophiles hitchhiked a lift on the spaceships we sent to Mars. Lichens are unlikely but extremophile microbes are a possibility, especially since in typical habitats less than 1% of microbes can be cultivated and studied. You can get an idea of the diversity of microbes that get onto the spacecraft before sterilization by studying the clean rooms. Studies of the clean room assembly rooms have found DNA for many archaea, and we have absolutely no idea what their capabilities are, just that they are able to withstand the conditions in spacecraft assembly clean rooms. Some of these microbes must survive all the way through to the final stage of Curiosity type sterilization which reduces the number of cultivable microbes to 300,000 over the entire spacecraft and possibly a hundred times that number of non cultivable microbes. The big question is, how much further do those numbers get reduced during the journey out to Mars, the landing, and the harsh conditions on the surface? And have any of these ever managed the final step to get from the spacecraft to some habitat on the surface, and to start to reproduce? For that to happen, they must find habitats that are compatible, which is hard, but with many extremophiles going to Mars on each spacecraft, if there are habitats on Mars for them to find, then maybe eventually one of them will find a habitat it is happy to call home. I think myself that it is vital that we get some ground truth about how well our planetary protection measures are working. If we have contaminated Mars, for instance Phoenix, or the Mars Polar Lander crash, it might well be a small localized spot of slowly spreading life. Perhaps it is reasonable to hope that we haven't yet seeded Mars with life able to reproduce in the surface conditions and live almost anywhere like the DLR lichen. After all such lifeforms seem to be exceedingly rare on the Earth as far as we know. But we could have contaminated, for instance with halobacteria (mostly aerobes, but has some anaerobic species) and other forms of micro-organism able to live in salt deposits. If so perhaps they are below the surface, and still localized. If so then it's reasonable to hope we could reverse the effect of the contamination. We could have contaminated with chroococcidiopsis also, which, if it can manage on the surface of Mars is harder to reverse. It might well be also that planetary protection has worked exactly as hoped, despite the apparent failures of Mars Polar Lander, and also - I'd say arguably Phoenix, which was sent to a region thought inhospitable at the time, but now thought to be quite possibly habitable for life. Phoenix was damaged by probably a meter of dry ice as the winter progressed. close up of phoenix soon after it landed. This is the spacecraft that landed in the ancient sea beds of Northern hemisphere Mars - and detected percholorates for the first time and evidence suggesting possibilities of deliquescing salts. Phoenix was only sterilized to similar levels to Curiosity and not to Viking levels. 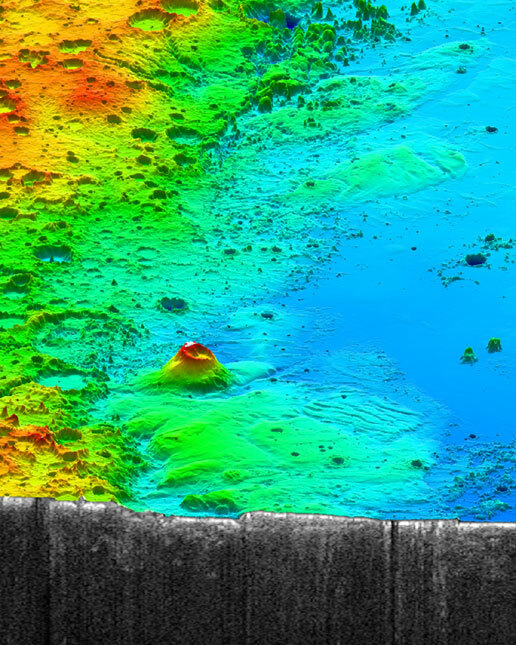 But it found that the area where it landed was much more habitable than expected. As well as the deliquescing salts, you also have a possibility of the solid state greenhouse effect, a thin layer of ice melted by the greenhouse effect of a translucent layer of dry ice overlying it in winter. Original image of Phoenix, and what it looked like a year later, damaged by the weight of probably a meter of dry ice over winter - this was expected - but the planners didn't count on Phoenix landing on a potentially habitable landing site. 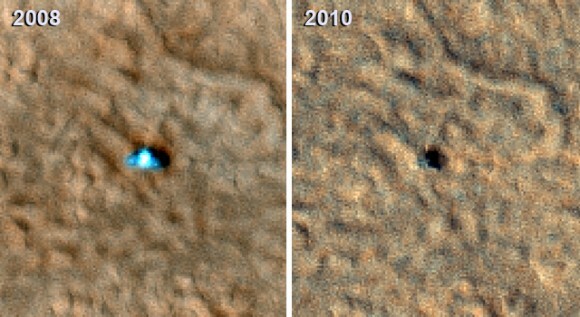 Is it possible that in the second image, that microbes from the lander have contaminated the surface of Mars and begun to spread? It's impossible to tell from orbit. One obvious way to test this is to send a miniaturized DNA sequencer, such as SETG, to the Phoenix landing site. Also to the Mars Polar Lander site, and to the original Soviet landing sites - all potential sites of contamination on Mars. Of course, that requires that the rover carrying SETG is adequately sterilized. Which may be easier now with the imminent approval of low pressure hydrogen peroxide sterilization for spacecraft. This would be a great thing to combine with a life detection mission on Mars as part of a biodetection suite of instruments - would land some way away from the spacecraft, look for life in hopefully pristine conditions - and then go up to the spacecraft and see if any DNA is found there. We would surely find some DNA from dead, and also dormant life on the spacecraft itself. The big question would be - has it spread at all to the surface. Hopefully we will find that we haven't contaminated Mars. But if we have, it would be a matter of some urgency to contain it and reverse the contamination. If it turns out that despite our planetary protection efforts over the last forty years, based on the best scientific understanding at the time - that we have contaminated Mars, then this does not mean that it's time to stop all protection of Mars. With some luck, it might have only one species or a few species from Earth, making it possible to disentangle Earth life from native Mars life. For instance perhaps we have only contaminated Mars with chroococcidiopsis, to take an example, or only with halobacteria. This could give us a chance at least to disentangle what we did from whatever pristine Mars was like before our spacecraft arrived. But introduce new contamination, with potentially hundreds or thousands of new species, including the archaea, and the situation will be extremely hard or impossible to disentangle. Most microbial life on Earth is not sequenced. In the case of the archaea, then we don't have representative micro-organisms even of most of the main phyla of archaea. This is the issue of "Microbial dark matter". For instance a recent study found that - "Of the 100 major branches, or phyla, of microbes, less than one-third have any described species", see How Many Microbes Are Hiding Among Us? We just have estimates of how many phyla there are. Given a chunk of DNA or an entire lifeform from Mars, unless it is something already well understood like chroococcidiopsis or halobacteria, it would be next to impossible to tell if it came from Earth or Mars originally. It might take some time to find out, and examining the immediate vicinity of the spacecraft sent to Mars may provide important clues for the detective puzzle. This would be especially tricky to settle if some life got to Mars from Earth in the recent past (or vice versa). Impacts on Earth able to send material to Mars happen every few tens of millions of years. One estimate suggests that 11 grams a year might get to regions with liquid water on Mars from the Chixxclub impact which ended the dinosaur era. Of course only the ones that arrived in the first few centuries or millennia after the impact on Earth would have a reasonable chance of getting there alive. It's also hard to get from Mars to Earth - this time because the life on Mars is sparse, if it's there at all, and in fragile habitats such as ice and salts, so is not easy for it to get on meteorite debris and impacts on Mars large enough to send material to Earth occur only every million years or so. Of course if it is obviously different, e.g. XNA instead of DNA, then would find out reasonably quickly that it is not from Earth. 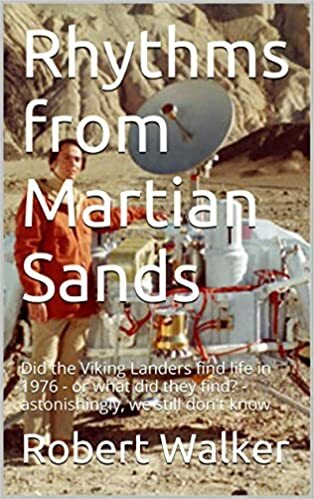 If it turns out that Viking did indeed find life in 1976, then life must be common on Mars. But if not, well life might be exceedingly rare. To take a simple example, what if photosynthesis never developed on Mars? Then we might need to search for places with chemical sources of energy. And what if only some of those chemical sources are used? We might need to look in exactly the right type of habitat to find it. Also what if the life spreads very slowly - and takes hundreds of thousands of years to colonize a new habitat on Mars? For instance the warm seasonal flows seem very habitable. But we don't know how long you continue to get them at a single spot. Dust storms may be a great way to spread life around on Mars. But what if the life hasn't developed dormant states able to survive in those conditions? Or what if the populations are just so low, lifetimes of a thousand years, that it's rare for microbes to cross from one patch of warm seasonal flows to another. It might take millennia, or hundreds of thousands of years to colonize a new warm seasonal flow region. If so, Mars could be a patchwork of uninhabited habitats and habited habitats. So, I think that most definitely we shouldn't give up on the search for life if we find a chemical explanation for the Viking results. But the Viking labeled release experiment, and successors to it, still remain excellent and important tools for the search for life. We should continue to use these methods, which detect life actually metabolizing, and not just rely on detection of organics, in my view. MOMA which is able to do chiral analysis - on Exomars. Levin's new version of his labeled release experiment from Viking updated to detect chirality. This is of especial interest since it could detect extraterrestrial life based on novel chemistry - something that most of the other instruments can't do. Though it depends on the life to be cultivable, which the others don't require. Another idea for life detection through cultivation is the Life Detection Array (LIDA), proposed (but not accepted) for one of the 2007 Mars scout missions. It works by "inoculating" a nutrient chamber with tiny nanogram quantities of soil, and an identical chamber with sterilized sample. The experiment then checks to see if there were any changes in chemical parameters in the chamber such as concentrations of ions, and effects of biofouling with mono layers, with the unsterilized sample. The tiny quantities of sample help to eliminate chemical effects. MOMA and the Raman spectrometer should go to Mars in 2018 as part of ExoMars. I don't know of any definite plans to send any of the other instruments to Mars. The problem with a sample return from Mars is, that unless you know it has life in it already, then you have no idea if it is worth returning as far as exobiology is concerned. Organics definitely don't indicate life, and even chiral signatures don't necessarily, as we know from meteorites. So the problem is the expense, of returning rocks. It's easy to inspect kilometer sized areas of Mars for life, using attempts at life detection to hone in on the areas of most interest. But you can only return grams to Earth, typically a kilogram at most. Then, many life forms would die during the journey back. In the case of Viking then if the active ingredient was life, then it seems that storage at 10°C for two months in darkness was enough to kill it. Either that or this process of storage changed the chemistry of the soil in some way, either way it shows the importance of looking at samples on the surface of Mars itself. Samples returned to Earth will not be identical to those on Mars. It's also a major planetary protection issues. I'm not convinced myself that we know enough to protect Earth from possible XNA based life on Mars which might also be so small it is well beyond optical resolution. Each time you get a new review of necessary conditions for Mars sample return, the researchers need to take account of new research. They express the hope that new research will not turn up new even more restrictive requirements, but also say that the results may need to be revised as a result of new research. I think a new review of a Mars sample return would surely take more account of XNA due to the vast amount of research now going on into XNA based life. It's considered an extremely hazardous possibility, on Earth, to create new XNA based life, to be done with great care. Surely it's also taking an unjustifiable risk to return XNA from Mars when you don't yet know what is in the sample? It could set up a new ecosystem that either co-exists with ours, or out competes it in at least some habitats, or ours out competes the Martian XNA everywhere. Only in the last case is it truly safe for Earth life. For more about this see my Why Phobos Might be the Best Place to go for a Sample Return from Mars Right Now, which goes into the XNA and other protection issues, and looks into the idea that perhaps we could learn more from Phobos - which is afar easier place to return a sample from also. In both cases I think that the sample should be sterilized, for the first few missions anyway. Possibly with ionizing radiation, easy to do, take a gamma ray source with you, and has similar effect to cosmic radiation which the ancient samples are subject to anyway. For more about this see my Phobos article. I put forward strong points of views in these articles for discussion. Surely some of you will have other ideas. Do put forward your own views in the comments, what do you think? And if anyone spots any mistakes at all in this article, however small, do say. I can continue to edit it and fix any issues found. Oh and do say of course if you know of any other possibilities for present day surface life in equatorial regions of Mars which I've left out. This article expands on some things I said towards the end of David Livingston's Space Show last Friday. I got inspired to write this article after listening to Gilbert Levin talking on the space show. Have thought about this a lot for some time now, as you can tell from this article, and this seemed a good time to write it all up as an article. Where Should we Send our Rovers to Mars to Unravel Mystery of Origin of First Living Cells? Some time in the hopefully hot to distant future I hope to write up the follow on article I promised a while back, looking at the wide range of places we can look for life in the solar system - not just Mars - also Europa, Encladus, Venus, comets, Ceres, some suggest Io even, Titan, Triton etc, for both Earth like and more exotic life chemistries.